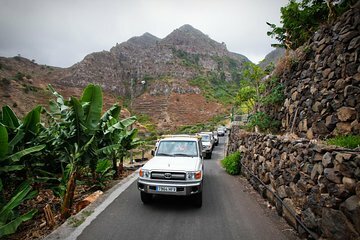 While in Tenerife, seize the opportunity to visit the neighboring island of La Gomera on this full-day 4x4 tour. Catch a ferry to La Gomera's capital, San Sebastian, and roam the island’s highlights by jeep, including the ancient laurel forest of Garajonay National Park. Plus, check out San Sebastian’s cobbled plazas, churches, and historical monuments related to explorer Christopher Columbus. Includes north and south Tenerife pickup and drop-off, jeep transport, ferry tickets, and lunch. Please wear comfortable clothes and shoes, and bring sunscreen, water, and a light snack.